Born October 9, 1920 in Kansas, he joined the Army Air Corps on March 30, 1942. During World War II, he served in the European Theater of Operations and was a prisoner of war in Germany after his aircraft was shot down while on a mission over Europe. He died on July 28, 1955 in an automobile accident while on active duty with the 405th Fighter Bomber Wing (Tactical Air Command) at Langley Air Force Base, Virginia. He was 35 years old at the time and was survived by his wife, Margaret Lilly Schooler, a son, Garth Stanley Schooler, and a daughter, Barbara Schooler. He was buried with full military honors in Section 2 (1024-4) of Arlington National Cemetery. During his military career, he was the recipient of the Distinguished Flying Cross, seven Air Medals and the Purple Heart Medal. He was the second cousin of Keith Barnes, who has graciously submitted this information in loving remembrance of Richard and his service to our Nation. Left to right, the Distinguished Flying Cross, the Air Medal (7), and the Purple Heart. 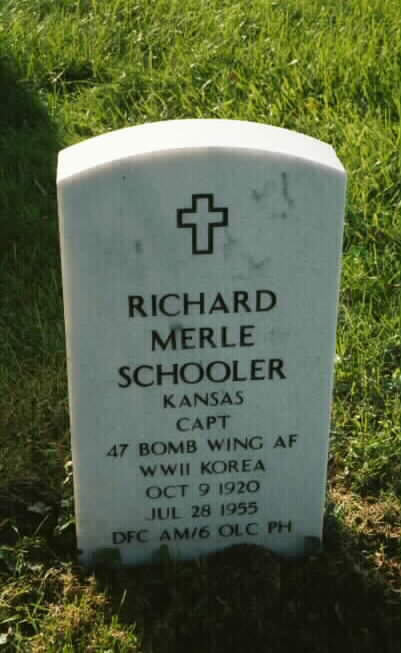 Second Lieutenant Richard M. Schooler 23, is a prisoner of war of the German government, according to word received by his parents Mr. and Mrs. G. D. Schooler, 5103 North Broadway, from the international Red Cross. Schooler had been reported missing in action over Austria after he failed to return from a Mission on May 10. He was bombardier on a B-17 flying out of Italy. His parents had received a letter from Major General Nathan F. Twining, commanding officer of the 15th Air Force, in which he stated that seven parachutes had been observed to leave their son's ship soon after it was damaged and while still over the target area,Wiener-Neustadt, Austria. The commanding officer also stated that Schooler had taken part in many difficult combat missions. He had been awarded the Air Medal recently. Schooler entered the air corps in June 1942, and was awarded his wings at Roswell, New Mexico in May of 1943. He was sent overseas the the first of March 1944. He was graduated from North High and was employed as a telegraph operator at Union Station before enter the Service. A twin brother, Staff Sergeant>Robert E. Schooler, is with a fighter squadron at Waltersboro, South Carolina. Word was received here Friday by Mrs. L. F. Losh of the untimely death of her nephew, Captain Richard Schooler, 34, of the United States Air Corps, who was killed instantly in a car accident Thursday at Roanoke, Virginia. Captain Schooler, who was held a prisoner for 2 years in Germany in World War II, was still serving in the air corps. He had been residing In England for the past three years with his wife and three children, Garth Stanley,8, Barbara Gail, 6, and Dixie Diane, one year old. They had just returned to the United States and after purchasing a station wagon the family was enroute to Florida to check in before getting his vacation which the family had planned to spend in Kansas and Texas. At Roanoke, the car skidded (no details were learned) and wrapped itself around a tree. Captain Schooler was killed instantly. Mrs. Schooler received such a badly broken leg that she was flown to Johns Hopkins hospital. The son, Garth, received a broken leg and was taken to a hospital at Langley Air Force base. The little girls escaped injuries. They are being cared for by their aunt, Mrs. Stanley Schooler of New York. Her husband and another brother, Bob, of Albuquerque, New Mexico, are with the family in this hour of sorrow. Captain Schooler, a son of Garth and Elma Schooler, was born October 7, 1920. His mother died several years ago but his father resides at Altoona. Besides his wife, children and father he is survived by two brothers and a host of other relatives. Memorial services were held Tuesday afternoon at Langley Field for Captain Schooler and burial was made Wednesday in Arlington National Cemetery.